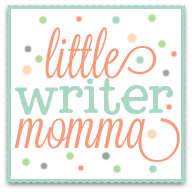 Alright, alright, so I guess you want to hear my second frazzled Christmas story...you all know I offer up my deepest, messiest mothering secrets to make you feel better about your own lives, right? It's always kind of funny and slightly startling when someone comes up to me at church, or in a store, or at the mall and says, "OMG I can't believe you sent your child to church without underwear OR cleaned them in a park sink OR took your entirely crappy day out on your husband to make you a crappy wife AND mother! OR dropped their Wendy's cheeseburger on the ground and then fed it too them. THAT was hilarious!" I always pause for a moment and think, "OMG. How do they know that about me?" "OHHHH. That's right! 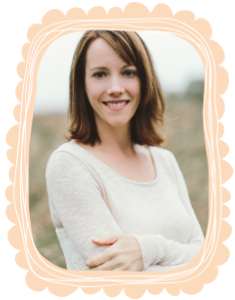 I share my deepest, darkest, most failed parenting moments on the world wide internet for ALL of the world to read." HaHaHa. I'm laughing too. I swear. That's fine. You can all thank me later. So, without further adieu, here is my second most frazzled Christmas season moment in the last couple of weeks. It starts with a picture...the picture tells the story, truly...see if you can guess what is coming when you take a look at this? 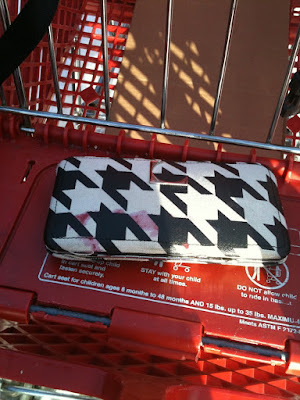 Now, I bet you're all wondering if this story has to do with the fact that my wallet is suspiciously sitting in a red shopping cart or the if it has to do with the purple gunk all over the front. Well, mostly the shopping cart...but it's kind of about both. See, this wallet is emblematic of my life these days; messy AND disorganized. Yesterday morning, I dropped my girls off at a local church for playschool. I typically like to use the time to get some reading and writing done, but given the length of my to do list this week that felt a little too self-indulgent so I decided to run some errands. The morning was going quite well. I stopped into a local liquor store to pick up some last minute bottles of wine and had a lovely conversation with a man who appeared to be the owner of the store about Massachusetts (where he had grown up and I had lived) and the Christian school I used to work at. He told me he LOVED those people at that Christian school and that they always had the prettiest cheerleaders. Totally random, but kind of funny nonetheless. I left hoping that my cheeriness and the reminder of the pretty cheerleaders from the CHRISTIAN school left some sort of positive imprint on his memory...who knows maybe it will remind him to go to church this weekend if he wasn't planning on it already! Off I went to Rite Aid and then to Target. The sun was shining for the first time in DAYS...maybe weeks...and I was footloose and kid free! I bumped into an old high-school friend at Target who actually said she had somehow stumbled upon my blog and enjoyed reading it-- always a LOVELY thing to hear...and a bit of unexpected encouragement. We'll all take that, right? I scored some super cool stuff for the girls in the $1 section. Found the rest of what I needed, checked out, packed my stuff in the car and drove over to Marshall's to finish my Christmas shopping. I was feeling like a pretty on top of it momma at this point. No wallet. Lisa! Where is your wallet? I rifled through the bags and the box and my purse in the front seat. I checked the door, and the back seat. I got out and opened the trunk and looked to see if I had put it in one of my Target bags. Some lady stopped to ask if I was leaving. She wanted my really good parking spot. I nodded a "NO" to her and continued to rifle through my stuff. Please God, Please. Let me find my wallet. It's got to be here! I opened the passenger seat door, AGAIN. Nothing. I opened the driver seat door, AGAIN. Nothing. A second lady stopped to ask for my very good parking spot. I nodded yes in my moment of resignation and decided I needed to drive back to Target. You know the end of the story since you've already seen the picture. I drove BACK to Target, found my cart in the same spot I left it (While God didn't answer my prayer for my wallet to be IN my car, His hand was certainly in the miraculous return of my wallet! ), looked down into the car and lo and behold, my wallet sat there, in the front pocket of the cart, just waiting for me to return. I grabbed my wallet and sat in my car in stunned silence and rolled my eyes at myself and shook my head. 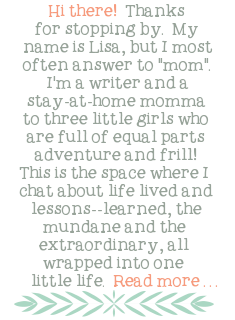 My heavens Lisa, HOW on earth do you live with yourself? 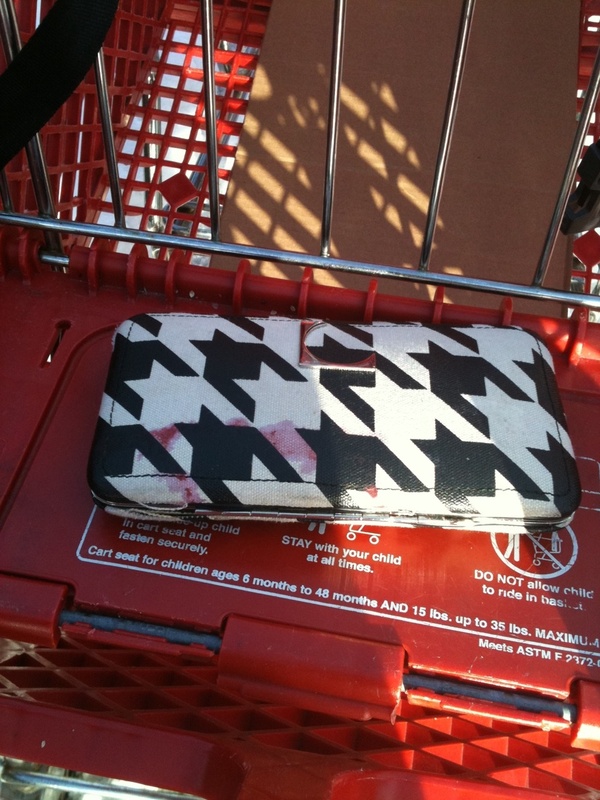 AND then, to make me even crazier, I got back out of the car, placed the wallet back in the cart and took a picture of it with my phone. I did ponder the need for medical or psychological intervention when I got back in the car. I mean SERIOUSLY, why does this stuff ALWAYS happen to me. I'm not really into the whole meditation thing but I'm starting to think that maybe I should be because I've GOT to do something about the major disconnect between my hands and my head. Just in case you were also wondering about the purple marks on the front of the wallet...the other night, after grocery shopping I picked up a purple Odwalla smoothie because I was feeling like I needed something healthy in my life. I was drinking the smoothie out of small dixie cups in my car and when I got home I somehow thought it would be o.k. to throw the dixie cup into my purse while I carried my groceries into the house. OBVIOUSLY not the best idea. Again, considering psychological intervention here because that probably should have been common sense. I wanted a new wallet anyway. Hope your Christmas preparations are going all and a little less frazzled then mine! I'm going to write something really nice and inspiring and relevant and reverential about Christmas before the week is out, I swear.